You may be looking for the Halo: Reach level of the same name. Halo: Nightfall is a live-action Xbox Originals webseries for the Xbox One, Xbox 360, and other Microsoft devices which was released in late 2014. Consisting of five episodes, the series was created by Scott Free Productions in conjunction with 343 Industries. Acclaimed filmmaker Ridley Scott was the show's executive producer along with Scott Free TV President David Zucker; it was directed by television director Sergio Mimica-Gezzan. In the series, "A strange and treacherous world exposes elite UNSC operatives to a much deeper danger." The five episodes of Nightfall aired on the Halo Channel weekly, on Tuesdays at 4 PM PST, starting on November 11, 2014 and concluding on December 9, 2014. Serving as an origin story for Agent Locke, a secondary playable character in Halo 5: Guardians, Nightfall is intended to connect the stories of Halo 4 and Guardians. An ONI unit under Locke's command is deployed on the distant human Outer Colony of Sedra to investigate terrorist activity. Sedra is described as a backwater world harboring a disdain for the Unified Earth Government and the UNSC. During their investigation, a Sedran city is attacked by a Sangheili terrorist wielding a biological weapon that only affects humans. Locke's team is forced to work together with Sedran Colonial Guard commander Randall Aiken and his troops to track down the origin of the bioweapon. During their search, the unit is drawn to a partially intact section of Installation 04, the Halo ringworld destroyed by the Master Chief in the first Halo game. A grave threat present on the ancient construct soon turns the mission into a desperate fight for survival. Nightfall will have narrative connections to Halo: The Television Series. The series also incorporates interactive features with the Halo Channel application for Xbox One. Viewers can complete challenges related to the series to unlock features that can be used in Halo games. Each episode has several challenges and "Second Story" videos that expand on events that were not shown in the series. Additionally, viewers can access the Halo Channel's new "Halo Encyclopedia" to gain information on characters, locations, weapons, and vehicles that are featured in Halo: Nightfall. The series opens with Colonel Randall Aiken, the Sedran Colonial Guard's commander, looking upon a sunset over Sedra City in his apartment with his daughter Natalie. In a voice-over, Aiken monologues about the nature of being a soldier and ominously hints at the events to come. The Sangheili terrorist activating the bioweapon. The story proper begins on the outskirts of Sedra City, where Lieutenant Commander Locke and his four-man team trail a Yonhet smuggler. The alien meets with a Sangheili Zealot and hands him a device known to be used to contain bombs. The ONI agents split up; Ramos apprehends the Yonhet while Locke goes after the Zealot. Locke follows the Elite into a city access tunnel, but the Zealot escapes after a brief duel. In the city, ONI operatives Jordan Gaines and Mason Hundley are implementing lockdown protocols but fail to prevent the Zealot from entering a crowded mall. Locke confronts the Sangheili and attempts to force him to surrender, but the Zealot instead jumps off a ledge and activates the device. The weapon releases an energy pulse which covers the entire city and beyond but appears harmless at first. However, civilians soon start showing symptoms of infection, having difficulty breathing and their veins being turned into darkened tendrils. Gaines and Hundley, who were in the immediate vicinity of the blast, are also affected and are taken to a Sedran Colonial Guard hospital where Colonel Aiken initially refuses to let the agents in due to his dislike of ONI. However, Locke convinces the colonel to allow the injured operatives to be treated. While Locke and his team undergo decontamination, reports continue to arrive of infections up to ten kilometers from the blast site. The bioagent, an entirely foreign element, appears to randomly break down human DNA, but does not affect the other species that also inhabit Sedra. Locke theorizes that the remote colony may have been chosen as a target to test the weapon before the terrorists move on to more populous worlds. The Colonial Guard find a colonial tug used to smuggle the element on the planet, but the pilots are nowhere to be found. Colonel Aiken reluctantly agrees to work with the ONI agents to track down the source of the element. Aiken violently interrogates the captured Yonhet, named Axl, about the identity of the tug's pilots. However, Locke, speaking an alien language, manages to persuade Axl to divulge what he knows. The Yonhet reveals that the element originated from a place even Sangheili Zealots avoid, calling it "hell". The Zealots instead buy it from smugglers who are willing to go there. Tracing the tug's positioning reveals that the vessel obtained the element from a fragment of Installation 04 that was thrown through slipspace during the ring's destruction and ended up orbiting perilously close to a red giant. However, there is no record of the mystery element being previously present on the ring, but Sedran Private Talitha Macer points out that it may have been newly formed in the supernova-level temperatures of the ring's explosion. A scan reveals that the element is found nowhere else in the observable universe. After detecting another tug approaching the ring, ONI opts to land there, capture the smugglers to gain proof of the Covenant breaking their peace treaty with the UNSC, and destroy the deposits of the element with a HAVOK nuclear warhead. The mission is particularly challenging because of the Halo fragment's close orbit to the red giant and its rapid spin around itself; when it faces the star the shard's habitable side undergoes extreme heat that is unbearable for any human. The fragment's environment only experiences survivable temperatures during the sixteen hours of "night" when the habitable side is facing away from the star, forcing the team to complete their mission within this timeframe. Locke contacts Rear Admiral Goodwin who approves the mission. After Colonel Aiken's daughter dies of the infection he and a Sedran Colonial Guard team join Locke's ONI unit and head for the Halo shard on a Condor dropship. The team's Condor approaching Alpha Shard. The second chapter opens with the team's Condor in slipspace on its way to Alpha Shard. During the journey, the ONI agents bicker with the Sedrans while Locke reveals to Private Macer that Colonel Aiken was once a Spartan, Randall-037, showing her a data pad with Aiken's file which includes an image of him in MJOLNIR Mark IV armor. The crew arrive at their destination and land on the Halo's surface. Donning their powered Nightfall armor, the ONI operators jump out of the Condor at a significant height while the Sedrans, with their less sophisticated combat suits, must rappel down. Macer pilots the dropship while most of the others move to secure an Alerian tug seemingly used by the smugglers. The freighter is empty but is accompanied by a compartment used to store horses, as well as hoof prints leading away from the site. The ONI-Sedran Colonial Guard team move to the tracks' direction and come across two smugglers—Arris Le and Haisal Wari—mining the element in a cave. The smugglers attempt to escape but are quickly caught and restrained by the ONI agents. The group heads back to the Condor for extraction; however, while the dropship is setting down, a large number of Lekgolo appear and begin to swarm all over its airframe, plunging it out of control. Macer is thrown out of the Condor, which then flies off erratically and crashes in the distance. More of the worms appear in large gestalt formations, killing the horses and three of the Sedrans. Fast and agile, the Lekgolo begin to pursue the group who escape to a narrow crevice where Locke uses a special appliance to holographically camouflage their position from the aliens, but the aliens quickly notice the camouflage projector and devour it. Arris is able to reveal that the creatures can sense active technology and movement, prompting the group to shut down the electronics present in their equipment. The Lekgolo examine the group, who avoid detection by remaining completely still. In the end most of the worms leave and the group move out of the crevice. Locke grabs a sole remaining individual Lekgolo and squeezes, killing it. The group crossing a river on the Halo fragment. While the nine remaining members of the team continue their trek across the surface it becomes apparent that due to their lack of off-world communications and the destruction of the Condor, the smugglers' two-seated tug will be the only means of escaping Alpha Shard, meaning that part of the group will have to be left behind. Colonel Aiken concludes that the team must work together until the mission is complete, whereupon they will draw straws to decide which two individuals will make it. They then move out to obtain the HAVOK warhead from the wreckage of the Condor and destroy the deposits of the element. To prevent detection by the Lekgolo, the group remove their armor, although they retain the ONI operatives' oxygen packs due to the limited amount of oxygen in the local atmosphere. During the trek toward the crash site, tensions within the group begin to come to a head as Horrigan suggests that the ONI crew should leave the Sedrans and smugglers behind. The smugglers remain reluctant to help, although Locke offers them a chance of survival, promising they will get to draw straws along with the others. The group soon take a break to refill on oxygen from the ONI agents' packs, but the activation of the devices alerts the Lekgolo to their location. As they continue onward, Samantha Wisner drops her breather and falls behind in an attempt to retrieve it. However, the device is activated upon rolling down a hill, attracting the Lekgolo to it. Ramos comes to check on Wisner, who desperately grabs him for help as the Lekgolo swarm over her. Ramos attempts to pull Wisner to safety but one of the Lekgolo bites his hand and he loses his grip. The worms then viciously devour Wisner while Ramos escapes just as Locke arrives to check on him. As the Lekgolo swarm attacks the group, Locke falls down a hill and his foot is stuck under a rock. Against Aiken's orders, Macer rushes to help Locke as the worms approach him. Locke urges Macer to leave, giving her the two breathers he is carrying and prepares to make a final stand against the aliens. However, Macer instead activates one of the packs and throws it away as a decoy to draw in the Lekgolo swarm while she saves Locke. The two then return to the rest of the group. With less than three hours left, the remaining members begin to despair. A shadow appears above of them, revealing to be a Lekgolo swarm taking Wisner's appearance. Horrigan throws Haisal to the worms, killing him and giving the team time to escape. Upon evading the immediate danger, Arris attempts to strike Horrigan, but is stopped by Estrin while Locke reprimands Horrigan for "playing god". As they move out, Locke converses with Aiken, with both knowing that factions will start to emerge within the team. Aiken tells him that he is already dead and he's willing to die, but Locke reproves him, saying he plans to survive. Aiken asks him if he is willing to sacrifice his team's lives to accomplish his goals. Locke replies that he is not willing to sacrifice his men. Minutes later, Horrigan speaks with Locke in private, desperately urging him to choose him to escape the fragment, but Locke maintains that he will let luck choose. The group arrive at a cliff, the bottom of which is overrun with Lekgolo worms. Ramos begins to lose his composure, watching a recording of his sons on his TACPAD, but Estrin throws the device away and snaps Ramos back to his senses. As they negotiate the edge of the cliff, Ramos proposes an alliance with Estrin but he rejects. Estrin trips off the cliff edge and urges Ramos to help him, to no avail; Estrin then falls into the abyss below, killing him. Once off the cliff, the survivors prepare to have an oxygen break, but a standoff ensues as Horrigan threatens Colonel Aiken and demands him to give up the sole remaining oxygen tank. Locke trains his pistol on Horrigan and orders him to stand down, but Ramos sides with Horrigan and the two force Locke to yield. Horrigan and Ramos then betray the team, take Arris as a hostage and they leave to the tug. Without weapons, oxygen and time, Macer says they are hopeless, but Aiken reveals to Locke and Macer that they have arrived at the Condor. Ramos makes his last stand. While Ramos, Horrigan and Arris attempts to go back to the tug, Arris tries to put Ramos against Horrigan by saying Horrigan is using both of them. Meanwhile in the Condor, Locke, Aiken and Macer find some weapons and finds that the Condor, now damaged, doesn't have the capacity to get them out of the ring, but they can go to the tug. Ramos confronts Horrigan but he replies to him that the tug has autopilot but also a biometric scan which is the reason why they needed Arris in the first place. With less than 30 minutes left, Aiken and Locke try to start to detonate the HAVOK nuke, but Macer reveals that there's a problem: the Condor has enough thrusters to fly but its cells are damaged, meaning they cannot get out of the canyon. Aiken then makes a plan: if they use the HAVOK's emergency cell, the Condor will have energy. Aiken orders Macer to put it into the Condor's system, but Locke says that they can't leave the bioweapon source intact. Aiken replies that the only way they can complete the mission is if only two of them go to the tug and the third manually activate the HAVOK. Near the tug, Ramos begins to suffocate, and he and Horrigan begin to use the last air source, but Arris manages to escape with the help of a laser cutter which he uses to cut his binds. In the Condor, Macer manages to activate the ship and Aiken orders to both of them to go to the tug, but both refuses. Aiken then breaks his daughter's necklace and empties some of the beads in his hand. He then explains that it will be decided by luck: the one who draws a red bead from his enclosed hand will stay behind while those with white ones are spared. In the end, it seems the one who will activate the HAVOK is Aiken. Before they part ways, Locke promises Aiken they will see each other in Valhalla. When Locke and Macer leaves in the Condor, Aiken reveals he cheated by hiding his white bead from view; there were no red beads in his hand since he wanted both of them to survive. Almost reaching the tug, both groups are attacked by Lekgolo worms; Horrigan betrays Ramos by activating his backpack, breaking his leg, and leaving him to be killed by the worms. The Condor crashes, Locke helps a crippled Macer and races to the tug. Arris starts the tug and the Lekgolo start going to the tug. Desperate, Horrigan turns on his assault rifle and kills Arris, but on his way to the ship, he is devoured by the worms, and they begin to envelope the tug. With no means to escape, Locke and Macer hide behind a few rocks. With few minutes to the sunrise left, Aiken activates the HAVOK and, unconsciously, draws the Lekgolo out of the tug and towards him. Locke and Macer enter the tug and escape the ring. At the same moment, the HAVOK detonates, killing Aiken, the Lekgolo, and destroys the ring fragment with its deposits along with it. "Death will come to all of us. Especially soldiers. It will come, inevitable as the sun. It is only to be feared if you fear what is on the other side of it, if you see darkness in your soul rather than light. In a way, I suppose soldiers are gods. You give your life away so others will live in peace, even if it's only fleeting. The ones who live carry parts of you with them, your deeds become seeds for theirs. The sacrifice carries forward. And in their final moments as a soldier, you know they will have to answer the same question you did in yours: with your life, would you only create death, or with your death would you create life? That is my question to you, Commander Locke, how will you die? And for what?" Every episode of Nightfall includes "Second Story" videos that expand and provide insight on characters and events of the series. Conceptual exploration of the Halo fragment which forms the primary setting of Nightfall. While the series had a $10,000,000 (USD) budget, equal to that of Halo 4: Forward Unto Dawn', 343 Industries considers the newer series' scope to be larger and more ambitious in terms of character development and setting. Producer Ridley Scott was quick to accept the project when it was first pitched to him as video game tie-in media was still relatively unknown ground to him. The name Nightfall refers to the circumstances of the main characters' mission aboard the Halo fragment: they are forced to complete their mission in the sixteen hours the fragment's habitable side remains in the "night" side of the star it orbits. The concept of having the main portion of the plot be set on a dying fragment of Alpha Halo came in around halfway to the script's writing process. Director Sergio Mimica-Gezzan wanted the principal setting to act as a "character" in itself that would drive the plot dynamics as well as evolve and change over the course of the story. The idea of having the setting be a fragment of a Halo was initially conceived by Jeremy Patenaude of 343 Industries' franchise team. The team then further refined the concept by deciding which one of the rings the Halo in question would be and how could its nature and location as given in the Nightfall story work in the broader fictional context. The franchise team put consideration into the size and shape of the fragment (including a "forensic analysis" of Installation 04's destruction scene in Halo: Combat Evolved) as well as the logistics of moving the fragment into a different system; the concept of Halos being equipped with an emergency slipspace capability which would place them in a destructive orbit was first introduced in Greg Bear's novel Halo: Primordium. The first official trailer was released on July 24th, 2014, at San Diego Comic-Con, which stated that Locke's team was tracking down reports of an element that specifically targeted humans on the distant colony of Sedra. Nightfall was filmed in Iceland and Ireland. Filming in Belfast, Northern Ireland was reported to have started by early June 2014 and finished as of June 12, 2014, being subsequently continued in Iceland. The scenes set on the colony of Sedra were filmed in Ireland, while Iceland is used to portray the locales of the Halo fragment. Iceland was considered an ideal filming location for the Halo due to the otherworldly and rugged landscapes present there. The cast and crew faced many difficulties due to the challenging weather conditions of Iceland. While the environment is meant to be uncomfortably hot in the series, the actual temperature was often below freezing as Iceland was experiencing the coldest recorded weather in some time in addition to frequent strong winds and rainstorms. To create the illusion of a hot environment, the cast had fake sweat applied on them which would rapidly freeze, becoming highly uncomfortable for the actors. Cast members falling over was also an everyday occurrence. Due to the hardships they faced the cast and crew would play games, place bets on falling on screen or nominate a "chief of morale" among them to keep their spirits high. On May 15, 2014, it was announced that actor Mike Colter is set to star in the feature. Colter plays the main character, Jameson Locke, "a rising star in a futuristic army with reservations about those in command". Locke was known tentatively as "Marlowe" during production. On July 10, 2014, it was announced that actress Christina Chong would play the series' female lead: Talitha Macer, a member of the Sedran Colonial Guard. Many of the roles in the series were rather physically demanding and there was a focus on the actors' fitness and athleticism in the casting process; however, it was noted that some of the cast still had difficulties with these aspects during filming. The Condor transport craft, known tentatively as the "Super Pelican", was created for the series as a Sedran equivalent to the UNSC's more modern dropships. A life-size set was created to portray the craft. The main characters are wearing armor that has been noted by Frank O'Connor as having been developed in Seongnam (the site of the UNSC's Special Warfare Center) and incorporating elements and technology from MJOLNIR, ODST and UNSC Marine armors. The Halo: Nightfall First Look trailer outlines the premise of the Nightfall story. It was first shown at San Diego Comic-Con 2014. First shown at PAX Prime 2014, the Halo: Nightfall Behind-the-Scenes feature focuses on the main setting of the story, the fragment of Installation 04. Released on October 20, 2014, Halo Nightfall In Cinema First Look is a behind-the-scenes video featuring previously-unseen footage as well as commentary by the cast and developers. It also shows the first glimpse into the principal threat in Nightfall. Released on October 22, 2014, Halo: Nightfall Trailer is the official trailer of the series. 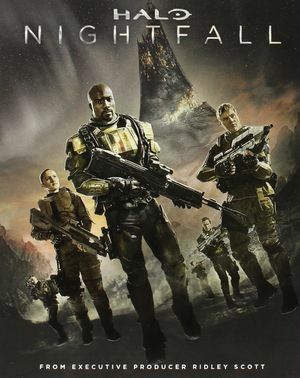 Promotional poster for Halo: Nightfall. Agent Locke, portrayed by Mike Colter. Promotional image of Locke's team. First image of the Alerian Tug. The barren landscape of Alpha Shard. The group on a cliff on Alpha Shard. The main cast on a hill. Macer, Wisner, Aiken and Locke. Locke and Macer taking cover. Horrigan taking aim with an MA5D assault rifle. Hundley and Gaines in a Sedran city. Locke watches the Zealot's Spirit dropship take off. A Lekgolo swarm mimicking Wisner's silhouette.